Here's a novel way to serve meatloaf! 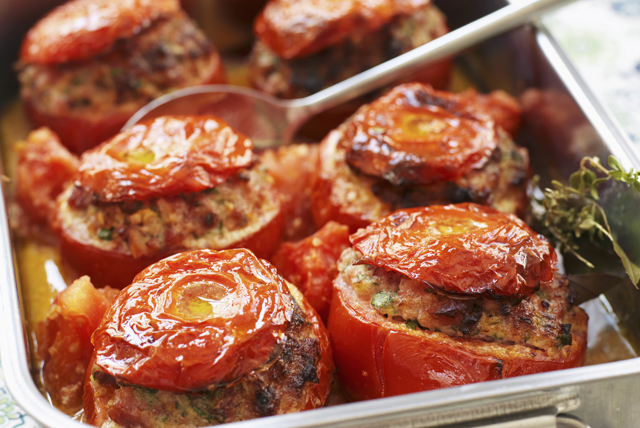 Our Meatloaf-Stuffed Tomatoes is a wonderful autumn recipe idea. Juicy beefsteak tomatoes are filled with a meatloaf mixture and then baked to perfection! Cut 1/2-inch-thick slice off top of each tomato; reserve for later use. Scoop out flesh from tomatoes, leaving 1/4-inch-thick shells. Chop removed flesh; place in bowl. Set aside. Place tomatoes, cut sides up, in 13x9-inch baking dish sprayed with cooking spray. Place meat and all remaining ingredients except dressing in large bowl. Add 3 Tbsp. dressing; mix just until blended. Place in tomato shells, adding about 1/2 cup meat mixture to each shell. Cover with reserved tomato tops. Spoon chopped tomato flesh along with any tomato juices from bowl around stuffed tomatoes in baking dish. Bake 50 min. or until meat mixture is done (160ºF). Transfer stuffed tomatoes to serving dish, reserving chopped tomato mixture in baking dish. Stir remaining dressing into chopped tomato mixture; serve spooned over stuffed tomatoes. Serve with hot cooked brown rice or whole wheat couscous, and a crisp green salad tossed with your favourite Kraft Vinaigrette Dressing. Garnish with 2 Tbsp. chopped fresh basil before serving.